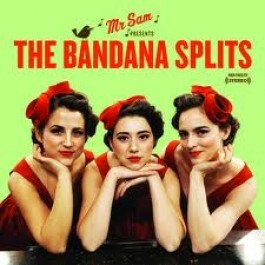 Hailing from Brooklyn the Bandana Splits are the new Doo Wop inspired group from alt-folk heroine Dawn Landes. Having worked with the likes of Josh Ritter, Landes has taken a change of direction to embrace the vintage sounds of Phil Spector. They have the cutsie girl group pin-up look of 50’s saccharine and cola floats, but with a wall of sound psychedelia they have created a perfect antidote to the sparse and whimsical Brooklyn sound. Taking lead vocals, Landes fronts the trio with Greenwich friends, Annie and Lauren Balthrop alongside producer Sam Cohen from Apollo Sunshine. Cohen plays all the instruments while the Split trio employ the harmonies of the Ronettes. Although hardly a cutting edge sound, their fuzzy lipstick dreams have been gathering a cult following and repeated plays of Lauren Laverne’s 6Music pop show. In advance of The Bandana Splits’ self-titled debut album released on Soul Boy on August 29, they have made available ‘Sometimes’ as a download HERE.